Members of the UC community recently received the sad news that Graeme Kershaw passed away. Formerly a technician in the UC Physics and Astronomy Department for 51 years, he was also restoring the Townsend Telescope. Here, Director of Alumni & UC Foundation Jo Dowling recalls working with Graeme. I had the great privilege of working with Graeme Kershaw and his wife Dale on the fundraising campaign to restore the Townsend Telescope which was damaged when the Observatory Tower at The Arts Centre came down in the February 2011 earthquake. His passion for the project, his commitment to UC and our wider community was always obvious to see. When the Teece family provided the majority of the funds required it was a very special day. Having been a technician in the physics and astronomy department for many years and having worked on the telescope through his career at UC, he was uniquely positioned to do the detailed work on restoring the telescope. Recently, Graeme was visibly delighted to be demonstrating the restored telescope at the astronomy exhibition being held at The Arts Centre. While it’s extremely sad that he won’t be able to see the telescope reinstated in the Observatory Tower, I know he would be very proud to have played such a vital role in giving Cantabrians access to the stars for generations to come. Last week astronomers and physicists at the University were saddened to farewell Graeme Kershaw, who served as a technician in the mechanical workshop of the Department of Physics and Astronomy for 51 years. 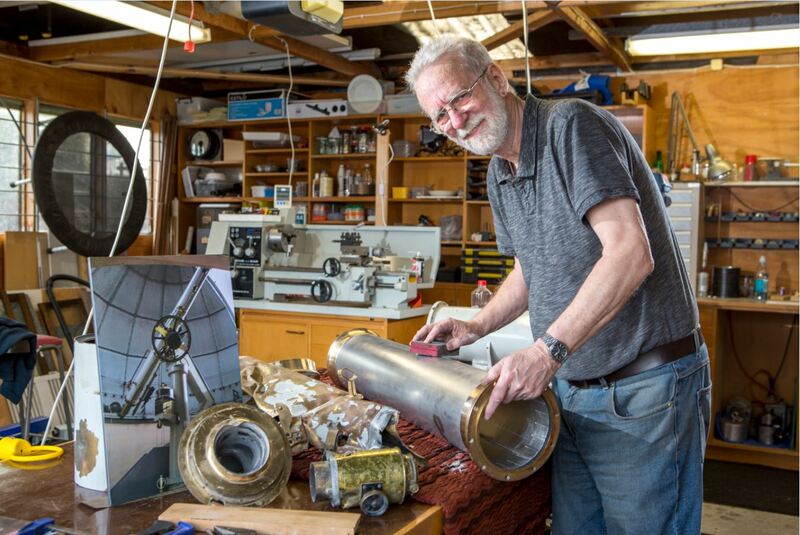 Professor John Hearnshaw recalls that Graeme specialised in astronomical instrumentation, and during his career made a major contribution to the instruments at Mt John Observatory. “I first came into contact with Graeme in 1975 when he was working on the Cassegrain échelle spectrograph, based on drawings from the Smithsonian Institution. This instrument was completed in 1977 and was the first of its kind in the southern hemisphere. The biggest projects Graeme worked on were the McLellan 1-metre telescope over five years (1981-86) and the Hercules spectrograph over four years (1997-2001). The latter was the world’s first vacuum high resolution échelle spectrograph for stellar spectroscopy. I count at least eight big projects we did together, me throwing ideas to Graeme about what I wanted, he putting them into practice with amazingly ingenious mechanical and optical designs for astronomical instruments at Mt John. His work was characterized by great attention to detail, superb craftsmanship and innovative designs. We’re pleased to welcome STA Travel back on campus, 7 years after losing the original store in the earthquake-damaged student union building. The world’s leading student and youth travel company (with exclusive airfares and deals on offer), STA Travel also has exclusive teacher fares which extend to full time tutors and lecturers at UC. A full-service travel agency, STA Travel can assist with the booking of flights, accommodation, day trips, tours and insurance and also specialises in cost-effective round the world flight combos, working holidays, volunteering and independent tailor-made travel. Travel can be costly, especially if flying long-haul or with family, but STA Travel offers flexible payment options via FLEXIpay which means no interest, no credit cards and no catches, just a $99 deposit will secure today’s flight price, with the rest due 10 weeks before departure. FLEXIpay is valid on a wide range of airlines, accommodation and touring across the globe. Drop into the new STA Travel Canterbury University store located in the Undercroft, or email Emma and the team on canterburyuni@statravel.com, and ask about opening specials for your next overseas or domestic trip. Do you know a doctoral student who may benefit from this? Encourage them to apply today. Do you find typical to-do lists less than satisfactory? You may find that a more visual layout of your to-do list helps. This device-independent tool called TRELLO* is my personal favourite. Trello is a free task management app that gives you a visual overview of what you have to do, what you are working on now, and what has been completed. Or it could be what you need to do next, what is in progress, and what is ready for review. Or it could be your shopping list: things you already have, things need to buy, things you have bought. You can apply it to all sorts of things. Use it in whatever ways work for you. I have multiple Trello “Boards” (lists). One for work, one for a particular project, one for things around the house, one for a holiday I am planning, and so on. The way Trello works is that to-do items are arranged like Post-it notes in multiple columns which in turn are laid out side-by-side. Once you have completed something, you drag it from one column to the next, e.g., from the Work In Progress column to the Done column. You can access the same Trello board on your computer, phone, and tablet. You can also share the Trello board with other people and assign tasks to them. Find out more about Trello here. *Trello was developed using the Kanban system, which was developed by Toyota as a system to keep production levels high and maintain flexibility. the Kanban system is often utilised using a whiteboard and Post-it notes. Check out our Archive of Tech Tips. Click the link, then hit the ‘End’ key on your keyboard to jump to the end of the Archive list where the most recent Tips are.